Fruits are not the only orange. All fruits are not orange. All orange are not fruit. Foodography thanks to SpittoonExtra and Becks and Posh which can be viewed on Flickr. 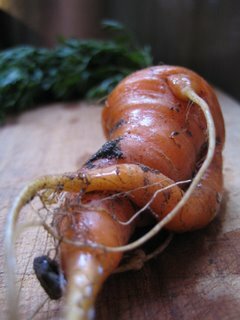 This carrot was one of a mob pulled from my mother's garden, plunged into boiled water, doused in butter and enjoyed - all within about thirty minutes. So sweet, yet still crunchy. The best way to have carrots and celebrate summer, fresh vegetables and the New Year! You're producing some great photos Emma. Thank you - I'm really enjoying it!